Our February meeting will take place on Saturday, February 3 from 10 am to 12 pm at the Kingston Community Library in Kingston, NH. 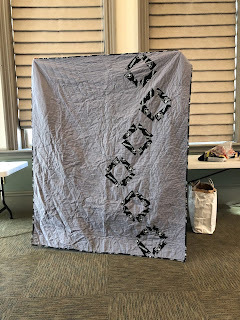 Several members will be demonstrating quilt finishing techniques: this month, burying threads, basting, and labeling. 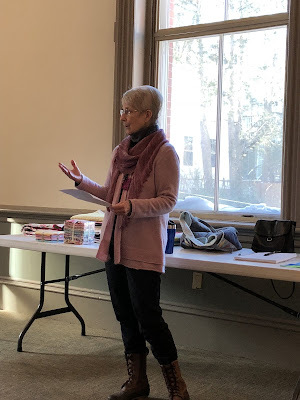 Our January meeting was held on January 6, 2018 at the Newburyport Public Library. It was a bitterly cold day, but we had eighteen people in attendance. Judy opened the meeting by discussing the due date for the 2017 BOTM quilt tops. Voting was split exactly in half, so those members who are ready with their tops in March will bring them to the March meeting, and those who are ready in June will bring them to the June meeting. Our guild is attempting to grow our social media presence in 2018. Look for more frequent posts to the Seacoast MQG page on Facebook and Instagram. You can help us by hash tagging your photos with #seacoastmodernquiltguild or #showusyourmqg . 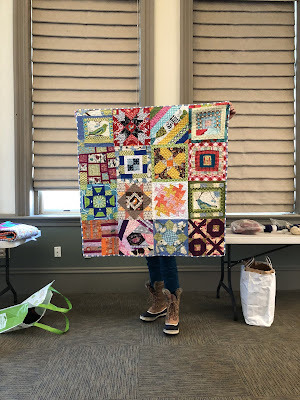 One of the goals of increasing our internet presence is to entice national modern quilting events and shows to consider New England as a viable venue. Please reach out to one of the members of the executive committee if you have questions about how to use social media. One of the national events is already planned for Boston area in 2018: Sewtopia is coming to Boston November 8-11 2018. 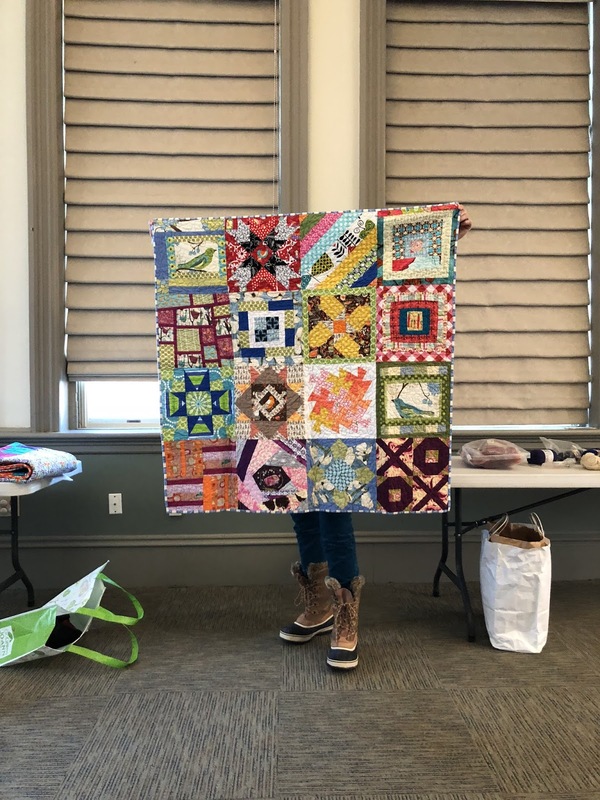 Sewtopia is a quilt-retreat-style event with lots of open sewing time. Registration opens February 12, 2018. Please check out the Sewtopia website for more details and consider attending this event. We are planning to run some technique demos this year in our regular meetings. 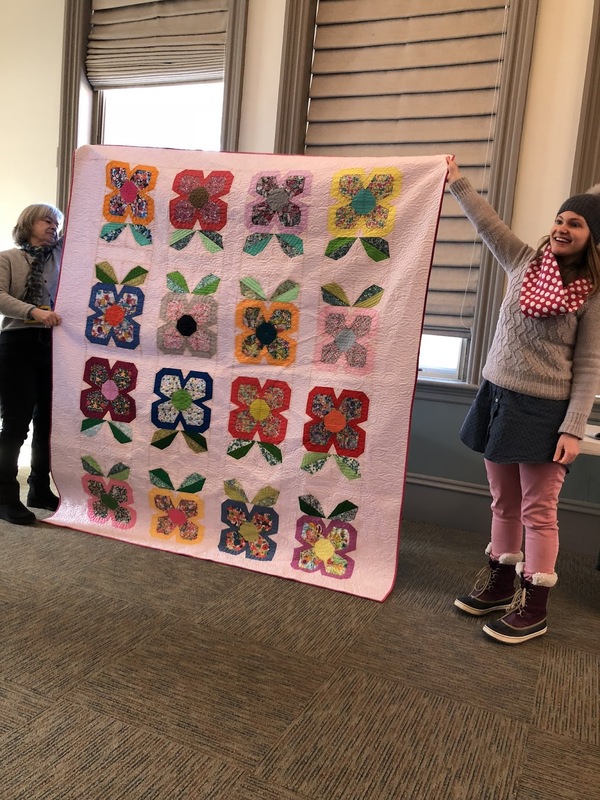 Examples include how to bury threads, different ways of binding quilts, labeling methods, quilt sleeves, basting methods, and quilting tool demos. 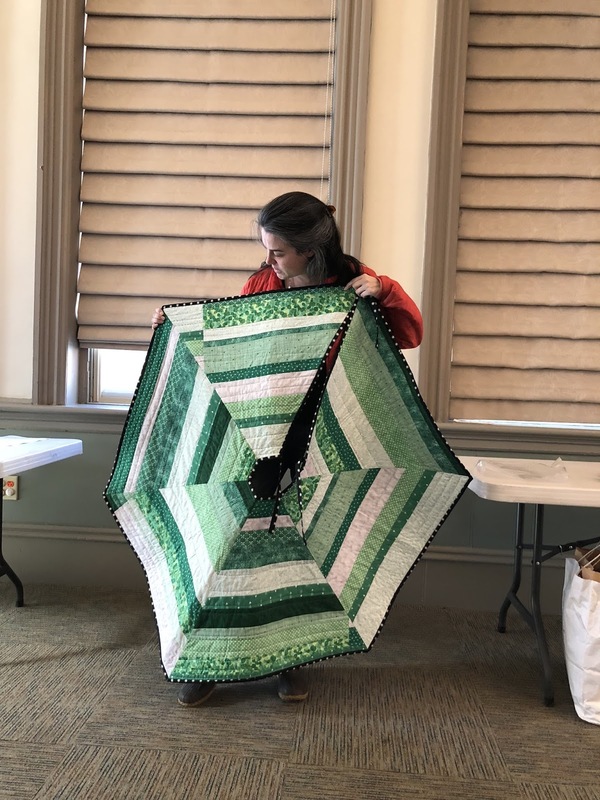 If you have a suggestion, or a quilting tool that you love that you would like to demo to the group, please reach out to Judy. Suzanne won our door prize, which was donated by Amy--she is the lucky new owner of a low volume scrap pack, and a 100 quilt blocks calendar. Barb gave the treasurer's report. We were able to donate $125 to Rosie's Place. Of special note, she mentioned that the first retreat payments are due February 1! Please mail your first payments to the guild PO box (Seacoast MQG, P.O. Box 774, West Newbury, MA 01985). You may also send PayPal funds but will have to pay a slightly higher amount due to the PayPal transaction fee. THE RETREAT COST SHEET will show you how much money is due on February 1, please consult it for details. 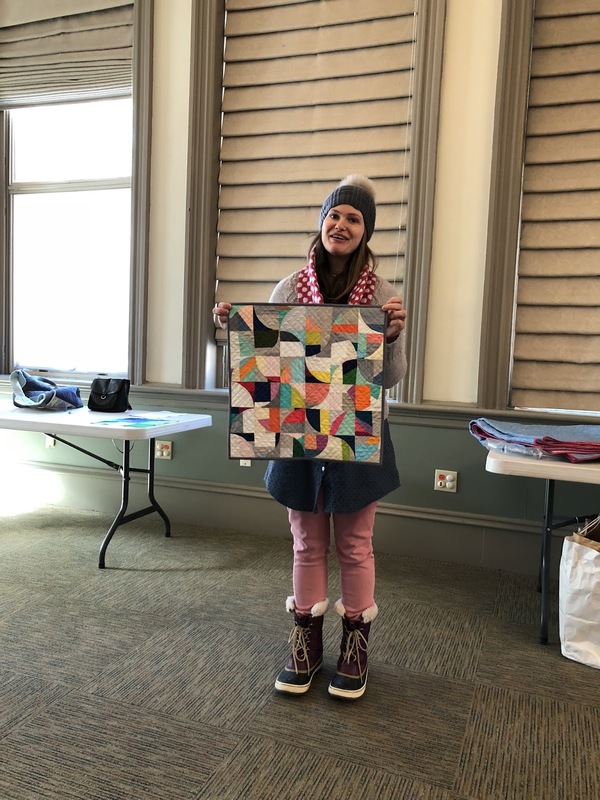 Kelly showed us two quilts that we found suitable for donation to residents of Haverhill who lost their home in a fire. Colleen is also investigating another opportunity to give to a family who lost their home. 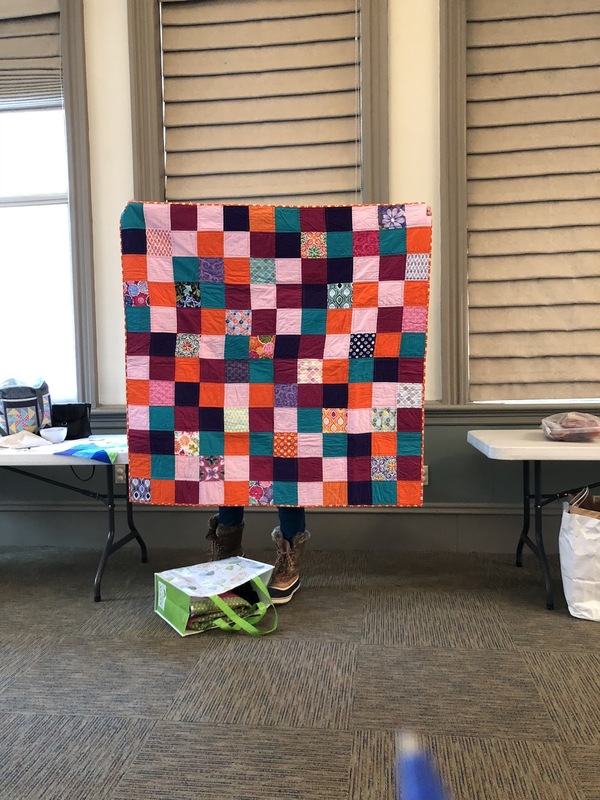 If you are considering doing some charity sewing this year, the most useful size is lap quilt sized, in colors suitable for both men and women. We have about six baby quilts left in the charity quilt stockpile. Laura is still collecting registrations for Amy's workshop on March 17. 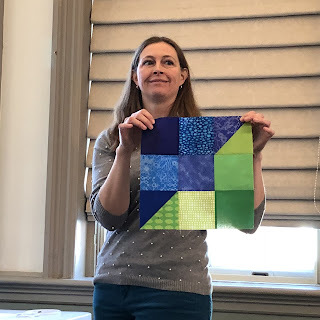 Amy had noticed that her workshops that followed a lecture on the topic of improv paper piecing were most successful, so we voted on the possibility of holding a lecture before the workshop. It was judged that there was not sufficient interest to hold the additional lecture event. Please contact Laura if you are interested in signing up for the workshop. The cost is $42 and DETAILS ARE HERE. You can mail your check to Seacoast MQG, P.O. Box 774, West Newbury, MA 01985. 1) Thank you blocks for Paula: To thank Paula for her service as president, we will be making churn dash blocks. 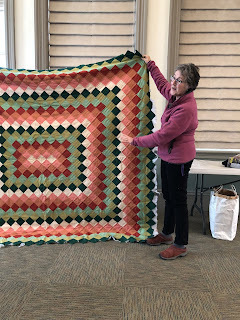 Blocks should measure 6, 9, or 12 inches FINISHED (so that means the blocks you bring in will be 6.5'', 9.5'', or 12.5''). Please choose any color you would like for the churn dash, and use a low volume background. There is a good chart HERE giving measurements for 6 and 9 inch blocks; Crazy Mom Quilts has a straightforward tutorial giving cutting sizes for a 12 inch block. 2) Charity blocks for Thomas Fire: Kelly is collecting blocks to send to Ventura MQG/Superbuzzy for those displaced by the Thomas Fire in CA. Please read more about the Ventura MQG's efforts HERE. 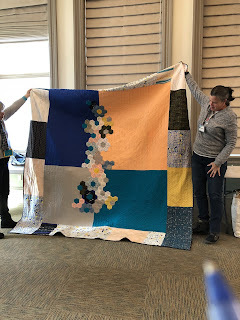 If everyone were to make two blocks, we would have enough to send a completed twin sized quilt block. 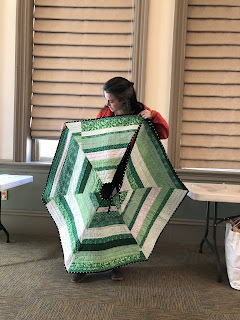 If you would like to participate, please use the Perikomen Valley Block tutorial to make your blocks in shades of jewel blue and grassy green. After snack break, Judy gave a talk on the characteristics of modern quilts. You can access her talking points HERE. 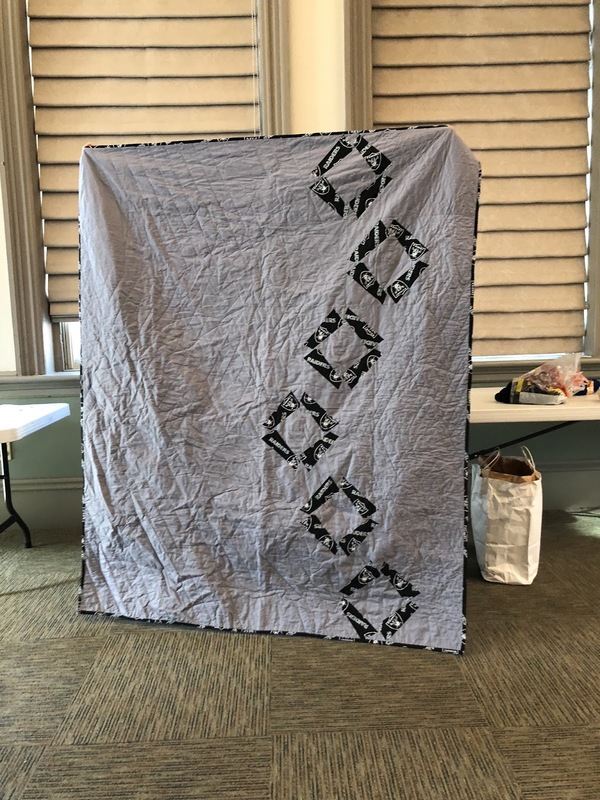 For the February meeting, please feel free to bring in a quilt that demonstrates examples of improvisation OR minimalism in design. 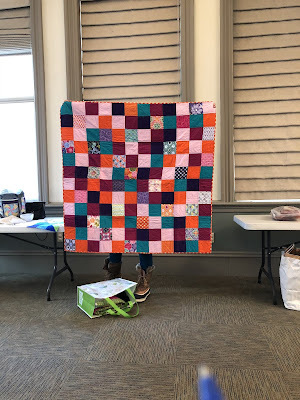 A mini challenge for the first half of 2018 was announced in conjunction with Judy's talk on modern quilting--PLEASE SEE DETAILS HERE. If you choose to participate, the word we are using is SNOWFLAKE. The prizes are good ones, so get your modern-design wheels turning! Letty chose to make her tree skirt in colors of green and white, and it is elegantly Christmasy! Bethany's hexie quilt started as a "gauge mistake" (her hexes were bigger than she expected), and turned into a lovely modern quilt. Nancy lucked out in her Bedford guild's swap! She gave her partner some fabric, and her partner gifted her back a lovely tote. 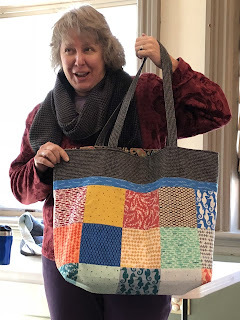 Recognize the Elizabeth Hartman Reef fabric from the Crayon Box challenge? Our regular January meeting will take place on Saturday, January 6, 2018 from 10 am to 12 pm at the Newburyport Public Library in Newburyport, MA. Remember that parking is either street parking if you are lucky and clever, or parking in a paid municipal lot. 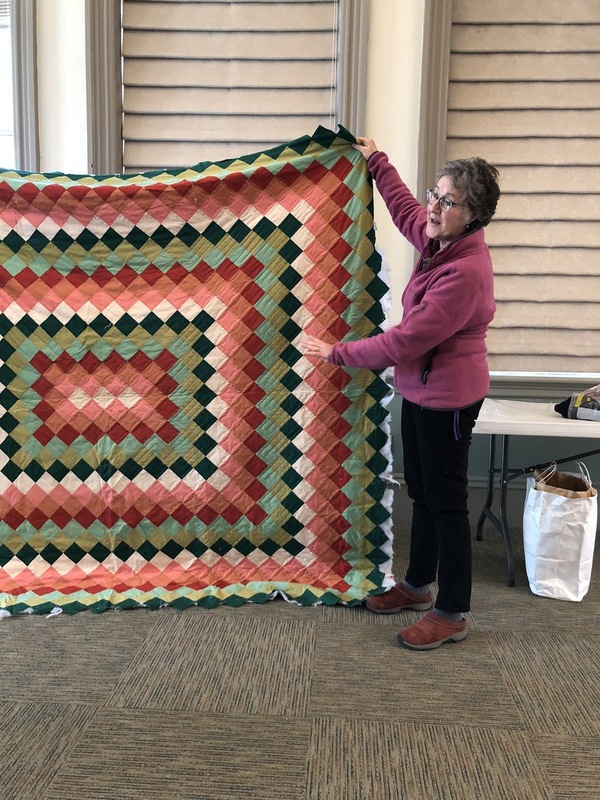 Judy will be presenting to the group about modern quilting. Come prepared to be inspired!